Update, September 16, 2018: On the Facebook page for the Units of Study group, Dr. Lucy Calkins announced that they are removing Stone Fox from the Units of Study materials. The new edition (Units of Study is published by Heinemann) will have a different book. The Facebook group is a closed group but Dr. Calkins said that anybody can request to be added and that "we say yes in seconds." They approved my request a few months ago. I am not a classroom teacher (and not using the materials), but I do study literature and am glad they are open to my participation in conversations. Stone Fox by John Reynolds Gardiner was published in 1980 by HarperCollins. It is part of a literacy program used in classrooms across the United States: “Units of Study for Teaching Reading”. Because of its many problems, I do not recommend the book and think that it is vital that Professor Lucy Calkins (she created the Units of Study program) revisit its use in her curriculum. Leaving it there means she--a trusted educator--is miseducating all the children who are in schools that use her curriculum. That sounds harsh--I know--but a key reason that I'm writing about this book is because Native parents and Native educators have written to me about it. The story takes place in the early 1900s, in what is currently known as the state of Wyoming. Prior to European and later, American, invasion, it was Indigenous land. A little over half of what is, today, Wyoming, was part of the Louisiana Purchase. The US bought it from France in 1803--but how and why does that narrative get told that way? Why do history books leave out the fact that it was Indigenous land before it was France or the US claimed it? These are not rhetorical questions! When teachers who teach students in those areas, today, leave out the history of Indigenous peoples, they tell Indigenous students that their history does not matter. How the people of an Indigenous nation are depicted is also tremendously important. Rather than depicting us as peoples of distinct nations that traded with peoples of other nations, and that had diplomacy with those other nations, we are shown as generic primitive, simple minded children or animal-like savages. None of that is accurate. That is, however, what we see in Gardiner’s Stone Fox. 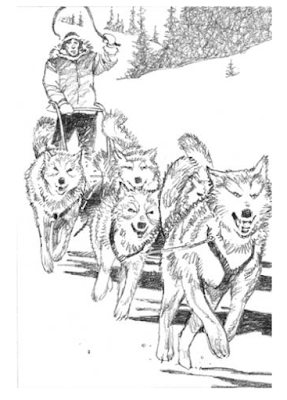 In that dogsled race, Searchlight (Willy’s dog) will pull a sled that his grandfather had “bought from the Indians” (p. 25). Indians is a generic term. 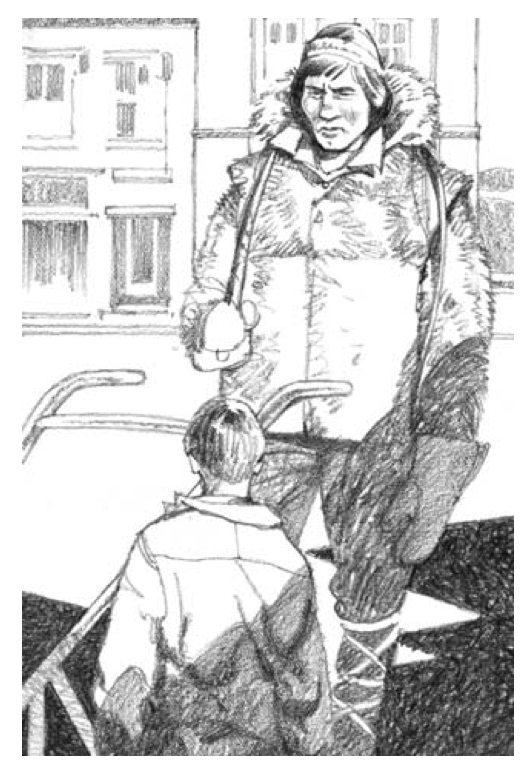 Not naming who he bought the sled from contributes to that generic image that falls into stereotypical thinking. We see that again when Willy learns that the race will be especially exciting this year because “that mountain man, the Indian called Stone Fox” (p. 45) might be in the race, and he has never lost a race he’s entered. The man was an Indian--dressed in furs and leather, with moccasins all the way up to his knees. His skin was dark, his hair was dark, and he wore a dark-colored headband. His eyes sparkled in the sunlight, but the rest of his face was as hard as stone. The Indian looked at Little Willy. His face was solid granite, but his eyes were alive and cunning. Cunning! Like…. A fox! Now we know why Gardiner created this name for this Indian. He wants readers to understand that this Indian is hard and cunning. And--he’s a giant! With a face of “solid granite”! All of this is negative stereotyping. Willy greets him, but “the Indian” doesn’t reply. Instead, "the Indian" looks at Searchlight. That makes Searchlight moan. Readers have come to like Searchlight by this point, and its moan tells them that Searchlight is worried or afraid of "the Indian". I'm intentionally using quotation marks for the Indian because Gardiner's repeated use of "the Indian" objectifies and others him. He's a man, for goodness sake. He could say that, instead! Stone Fox refused to speak with the white man because of the treatment his people had received. His tribe, the Shoshone, who were peaceful seed gatherers, had been forced to leave Utah and settle on a reservation in Wyoming with another tribe called the Arapaho. It is good to finally have some specific tribal nations named in that passage, but “peaceful seed gatherers” plays into the stereotypical idea of primitive Indians. And, there’s more than just one nation with the name Shoshone. In fact, there are several, currently located in California, Oregon, Nevada, Idaho, and Wyoming. Who, specifically is Gardiner talking about? And he tells us they had been forced to leave Utah? By… whom? And… why? And how?! Those are huge gaps in Gardiner’s story. Stone Fox’s dream was for his people to return to their homeland. Stone Fox was using the money he won from racing to simply buy the land back. He had already purchased four farms and over two hundred acres. That Stone Fox was smart, all right. In that passage, readers learn why Gardiner decided to call this character “Fox” and “cunning” and “smart”? Gardiner doesn’t say so, explicitly, but he’s telling us that Stone Fox has chosen to embrace American capitalism. He’s using money to get that land back. Sounds heroic but what would we find if we looked into the Shoshone peoples and the efforts they made to protect, retain and recover their homelands? What treaties did they make? What parts of those treaties were -- and are -- ignored? Gardiner tells readers that the Shoshones of his story are in Wyoming, which suggests to us that he’s referring to the Eastern Shoshone, who negotiated the Ft. Bridger treaty in 1863. According to information on the Eastern Shoshone’s website, that treaty established the boundaries for what is currently known as the Wind River Reservation. In size, it was over 44 million acres and it covered parts of Utah, Idaho, Montana, Wyoming, and Colorado. In 1868, a second treaty was negotiated. The outcome of it was that the reservation was reduced to 2,774,400 acres in Wyoming. Today it is approximately 2.2 million acres. With that as context, Stone Fox’s purchase of 200 acres is bit silly to me, but to Gardiner and most readers, it will seem heroic in an American pull yourself-up-with-your-bootstraps kind of way. A sweeping motion, fast at first; then it appeared to slow and stop. But it didn’t stop. A hand hit little Willy right in the face, sending him over backward. “I didn’t mean any harm, Mr. Stone Fox,” little Willy said as he picked himself up off the ground, holding a hand over his eye. Stone Fox stood tall in the darkness and said nothing. Willy continues talking to Stone Fox, telling him that he (Willie) is going to win the race, and that if he doesn’t, “they” (the government) are going to take their farm away from them. The next day (race day), Willie's eye is swollen shut. There’s a lot to say about that particular passage in the book. Stone Fox is violent and clearly willing to strike a little boy in the face, knocking him down and hurting that boy’s eye. That plays into the stereotype of the cruel Indian who has no compassion or human-like feelings for others. It is also interesting to think about why Gardiner has Willie tell Stone Fox about his reason for being in the race. Given what we already know about Stone Fox needing money to buy land for his people, I suspect we’re supposed to make a connection between Stone Fox and Willie. Missing (again) is any reference to the greater injustice that Indigenous peoples experienced at the hands of those who took their lands from them. That sentence is the way many writers depict Native speech. Where is the word "if" at the start of that sentence, and where is the word "will" in the last part?! After uttering that sentence, Stone Fox nods to Willie, who then carries Searchlight across the finish line, winning the race. He’s gone from Willie’s threat to Willie’s savior, but his “help” is just like he has been throughout: violent. His only words of the entire book are that he will be violent. The stereotypical ways that he is depicted are a problem. They do not interrupt the existing stereotypes that children bring to their reading of Stone Fox. It is a dramatic ending. The story itself is thrilling and teachers report how well it works with reluctant readers. Those who object to the book do so based on the death of Searchlight. That, some feel, is inappropriate content for young readers. The Alaska Native Knowledge Network has some book reviews on its site. Richard Schmitt, a student in ED 693, reviewed it on March 6, 2006. He notes similar problems in stereotyping. In 1991, Christine Jenkins and Sally Freeman raised questions about it in Novel Experiences: Literature Units for Book Discussion Groups in Elementary Grades. So did the teacher, Paul, in McGee and Tompkin’s 1995 article, “Literature-Based Reading Instruction: What’s Guiding the Instruction?” in Language Arts. My point in listing these articles is that the analysis can be done. The problems are there. People have seen then since 1991 (and likely earlier!). As noted above, Stone Fox ought to be removed from the Units of Study for Teaching Reading program. It will cost the publisher (Heinemann) money to do that, and Calkins will have to spend some time looking for a book to insert in its stead. I don't know that program well enough to suggest an alternative. If you do, let me know in the comments. Here's an interior page that shows Stone Fox and his team. Do his dogs look mean to you? They do to me! I wondered how dogs look when they're racing. I found lot of photos. Mostly their tongues are hanging out. They don't look mean to me. These ones look kind of... sinister! Here's the 30th anniversary edition cover. Stone Fox was also made into a movie, which is evidence of how well this story plays to non-Native readers. And, to Lucy Calkins. And to so many others. But again--the Native content is deeply problematic! Published in 1980 by HarperCollins, John Reynolds Gardiner's Stone Fox is not recommended. Zoe and the Fawn (2006). By Catherine Jameson, illustrated by Julie Flett. Penticton, BC, Canada: Theytus Books. Little Zoe and her dad are feeding their horses when Zoe is captivated by a fawn lying under an aspen tree nearby. Dad takes a picture. Zoe wonders where the fawn’s mother is, and Dad suggests they look for her. They walk through the spring landscape, spotting a series of creatures that Zoe suspects could be the fawn’s mother: a flicker, a rabbit, and a rainbow trout. No, Dad tells her each time, that is not the fawn’s mother. Finally, they turn around and head back. Again they see the flicker, the rabbit, and the trout, and this time Zoe is the one asserting, “That is not the fawn’s mother.” When they arrive back at the aspen tree, there is the fawn – with its mother. Dad snaps another picture. The horses are glad to see Zoe and her dad. Jameson tells the story of this Okanagan father and daughter with relatively simple English vocabulary, with some repetitive phrases that invite children’s participation during read-alouds. She also incorporates the Okanagan (Syilx) animal names in parentheses. 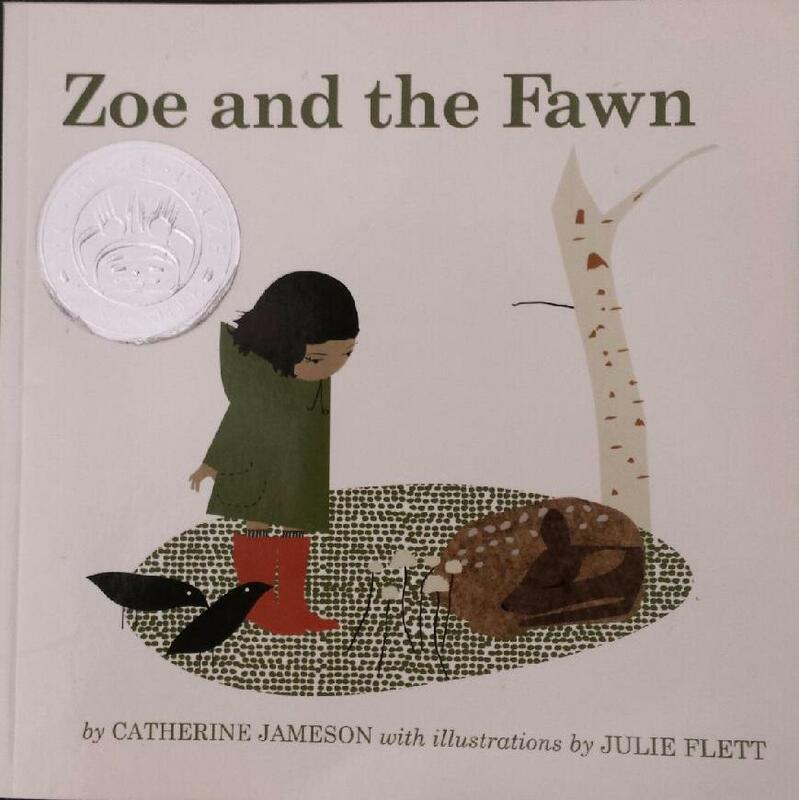 So – those animal names Catherine Jameson uses in Zoe and the Fawn back in 2006 have important context. They hint at a language preservation effort that was surely underway back then, and that has lasted, as the Okanagan Nation language Web site suggests, “a long time”. I went to the Web site looking for a pronunciation guide and found a people’s commitment to their language and all that it has meant and can mean to them. I like Zoe and the Fawn a lot. The English text is highly readable and engaging for kids who are still learning to read English – and for younger ones, who will enjoy chiming in on the repetitions. 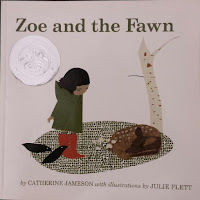 Julie Flett’s illustrations (which I believe are cut paper plus pen-and-ink) capture Zoe’s sense of wonder, the beauty of the awakening world of spring, and the essence of the creatures Zoe and Dad encounter. The fish are especially lively, and Flett has a knack for including cool things that aren’t in the text – like the turtle who joins Zoe on one page, or the activity in the pond where the trout resides. Being married to a photographer, I found Zoe’s dad with his camera to be a nice touch. And Zoe’s quite expressive and adorable in her green coat and orange boots. Zoe and the Fawn: highly recommended! In this morning's mail is a letter from a parent in the UK who is looking for resources with basic information she can share with her children, especially about Indigenous peoples in Canada. At some point, this parent was told that if a Native person in Canada leaves their reserve for a big city, they lose some rights on their reserve. Is that true, she wonders, and does it apply to every Indigenous nation? My guess is that it might be true on one, but not on all--but that is a guess because I'm not in Canada. 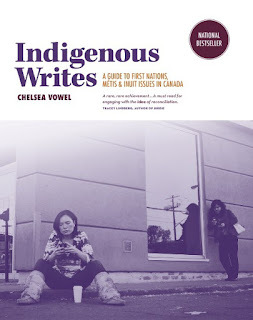 Chelsea Vowel's Indigenous Writes: A Guide to First Nations, Métis & Inuit Issues in Canada is the first place I'd look for information. It is concise, packed with information, and in some ways, humorous. The title of the first chapter, for example, is "Just Don't Call Us Late For Supper: Names for Indigenous Peoples." What Vowel does there is poke at the dreadful ways that non-Native writers come up with names for Native people. I can imagine a snarky White mother telling her kid who is always late for supper "Your Indian name is Late For Supper." That sort of thing happens a lot. People think it is funny--but how people name their children ought never be something that others joke about. That said, the chapter is not about personal names. Vowel begins with a list of words that are not acceptable: savage, red Indian, redskin, primitive, half-breed, squaw/brave/buck/papoose. Then she provides a terrific overview of names broadly used for Indigenous peoples, and specifics, too. 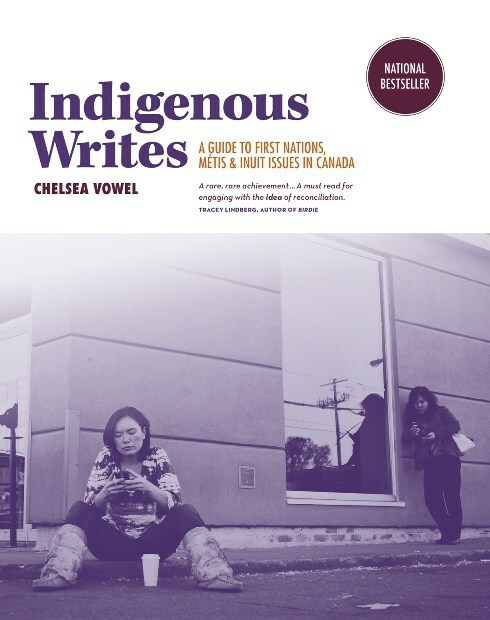 Published in 2016 by HighWater Press, I highly recommend, Indigenous Writes by Chelsea Vowel. Get a copy for your public or school library and let teachers and parents in your community know about it! Put it on display!